With the K-12 curriculum already implemented in the country, students are highly expected to be equipped with employability skills in as early as Senior High School (SHS). With this vision, our education system needs well-researched and effective resources that will aid in making Filipino students job ready and at par with international students. "No one can discount the reality that in today’s world, more than ever, employability skills are very essential... One’s qualification enables a person to secure a job, but it is his/her skills that would nourish his/her worth in the organization. It is from this realization that this book was born." 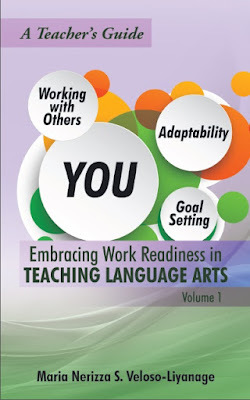 With both teachers and students in mind, the author has carefully and strategically constructed lessons which creatively link English Language instruction and the essential ‘job getting skills’: Adaptability, Goal Setting, and Working with others. Each unit comprises of clearly defined learning goals with realistic time duration. Every activity is well thought out, engaging, and some are patterned to real life scenarios which can hone other skills and capabilities like problem solving, planning and organizing, communication, teamwork, initiative etc. Exercises and games vary and are customizable. At the end of each chapter, assessment guide is provided for the instructors. There are also valuable pieces of advice drawn from the author's personal experiences. I was really amused with the role-playing and the exciting treasure hunt activities. As a freelance tutor, I can practically apply these exercises. I think the book needs a little improvement on its visual appeal (tables, pictures, diagrams,cover etc) and included support material for the Grammar Practice Section would be awesome. At a glance, this e-book may seem simple, yet it's well structured, inventive, straight forward, with solid, practical, and interesting content. It is a useful tool in instilling work readiness and confidence to students. It is now available on Amazon and Kobo. 2. 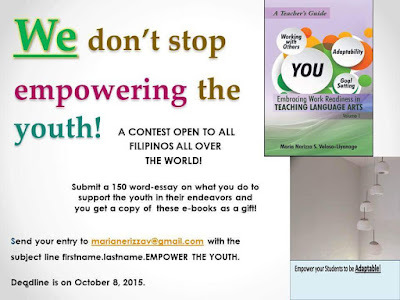 Email your entry at marianerizzav@gmail.com with the subject line- firstname.lastname.EMPOWER THE YOUTH. Provide age, city and country. 3. This is open to all Filipinos regardless of residency. 4. 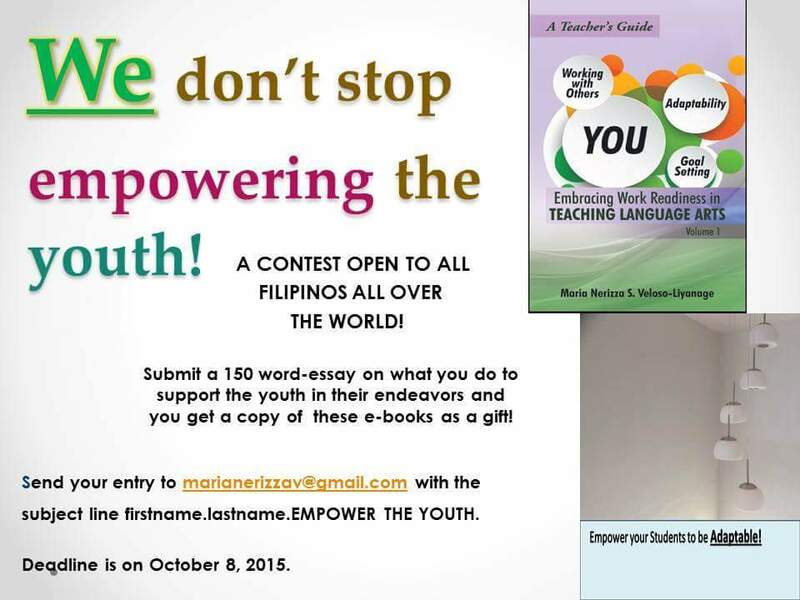 Deadline of submission is on Oct.1 Oct8,Thursday. Winners will be notified and will receive the prize directly from the Author thru email. Maria Nerizza S. Veloso-Liyanage is a Filipino educator who is in the process of strengthening her ground in teaching. She earned her Bachelor in Secondary Education in English from the Philippine Normal University and passed the Licensure Examinations for Teachers in 2005. 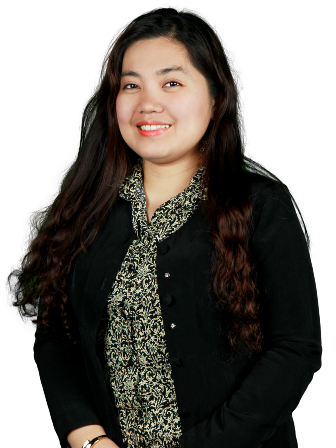 She has recently completed her Master of Education in Leadership and School Improvement from the Universiti Brunei Darussalam. Over the last ten years, she has gained a repertoire of experiences from taking various support and leadership roles in customer service, training, organizing extracurricular activities and events, writing press releases, marketing, public relations, and liaising with different organizations for students’ on-the- job training.She has taught both in the classroom and in online setting. She has taught English and communication to Filipino, Bruneian, Korean, and Japanese students. She is currently teaching communication and business subjects in a private college in Brunei Darussalam.Working in a foreign country where cultural diversity is very strong has made her understand people in different ways. Her work mentalities and philosophies have changed over the last seven years. 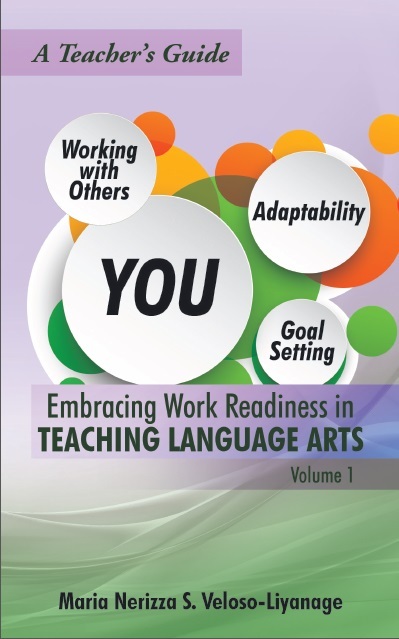 She does not consider herself a writer, but through this book, she would like to be able to share to young educators how to equip their students with practical employability skills. You may also follow her at Snippets of Wonders and check her on Facebook. ***For every action YOU take, RB will donate $1 to Save the Children. Together we can work towards removing diarrhea as a top 5 leading cause of death amongst children by 2020. Help us to reach 1 million actions. It's ON! Lazada 12.12 Online Revolution! Devote yourself to an idea. Go make it happen. Struggle on it. Overcome your fears. Smile. Don't you forget: THIS is your dream. Copyright © 2014-2018 · kalikotpepot.blogspot.com · All Rights Reserved. Powered by Blogger.